Bunnies are wonderful animals and they make such lovely companions, but they aren't the easiest to look after and it's so important that you do a lot of research if you're thinking of welcoming one into your family. Please don't buy a bunny for a young child for Christmas unless you know that they're very responsible and that there's an adult that will help out consistently. If you're looking for a first pet for a child I would really consider guinea pigs instead of a bunny. Any pet is a lot of work & a commitment, but guinea pigs are a little easier (from my past experience!) than rabbits are. I had guinea pigs from when I was about 8 until 16 and I loved them! Bunnies are a huge commitment (time & financial! ), they generally live between 8 and 12 years. A lot of bunnies I've met (including Ralphie) aren't fond of cuddles or being picked up. He'll happily sit next to me for hours having his ears tickled or to be brushed but if he thinks I'm going to try and pick him up, he'll be off like a shot. Bunnies like a wide variety of veggies to go along with their bunny food and copious amounts of hay. 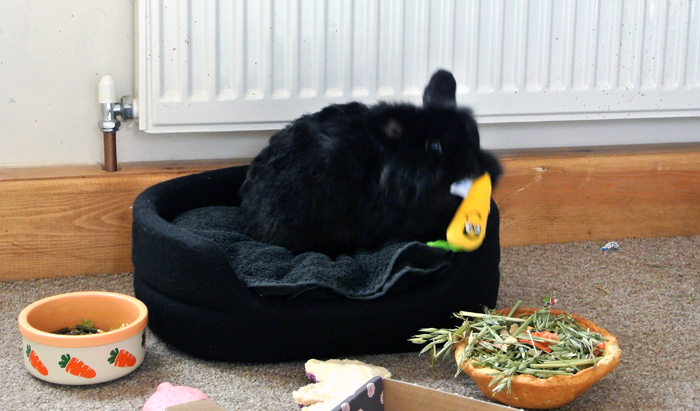 Taking the time to find out what your bunny likes to eat is really important! They also like toys to keep them occupied. If they get bored they will probably start to chew anything and everything in sight. Ralphie is quite picky with toys, but he generally loves anything he can nibble and destroy! They also need to go and get their vaccinations, especially if they're going to be living outside. They're definitely quite a big financial commitment. Bunnies also need a lot of space, I don't think that any rabbit should be cooped up in a small space for a large percentage of the day. If they're going to be mainly living outside, a roomy hutch with a run attached would be idea - just make sure they can't dig their way out and foxes etc can't get inside! Make sure you research different hutch options for outside, I'm not an expert on this so unfortunately I can't offer too much advice. 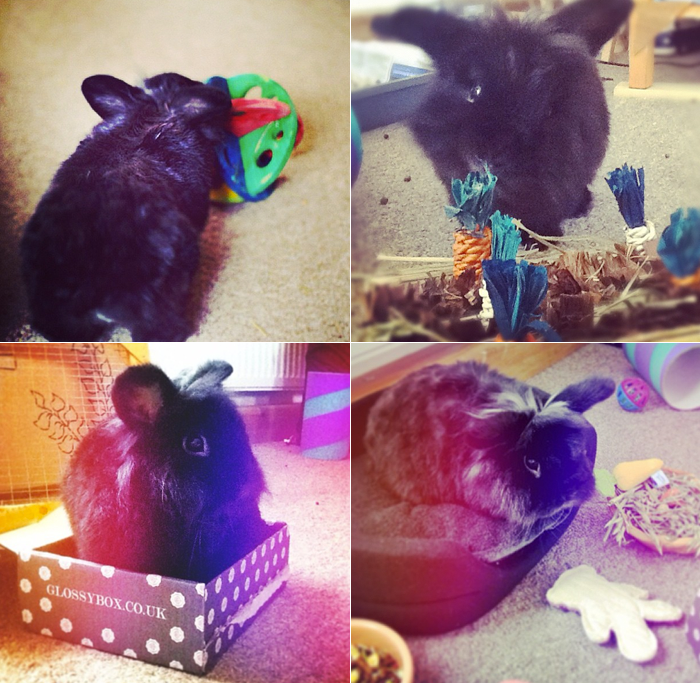 Ralphie is a house bunny and lives in a play pen similar to these. He has a wooden house that he sleeps in, which is cosy and comfortable. 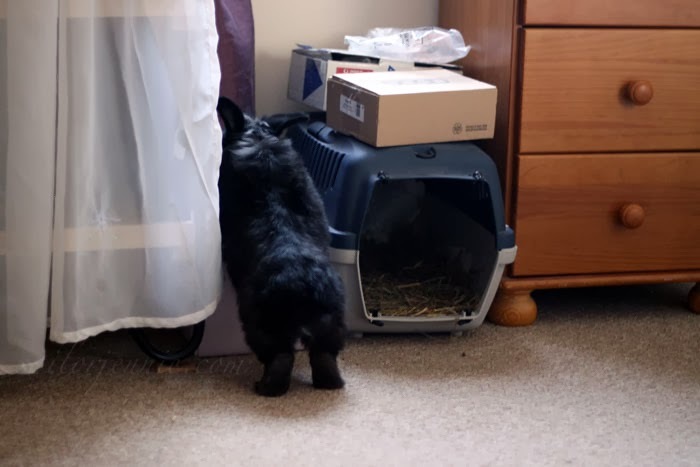 Whenever I'm at home, I leave the pen door open so he can hop out and explore the upstairs of our home if he wants to. He loves being out, so usually as soon as the door is open, he's off and ready to explore! 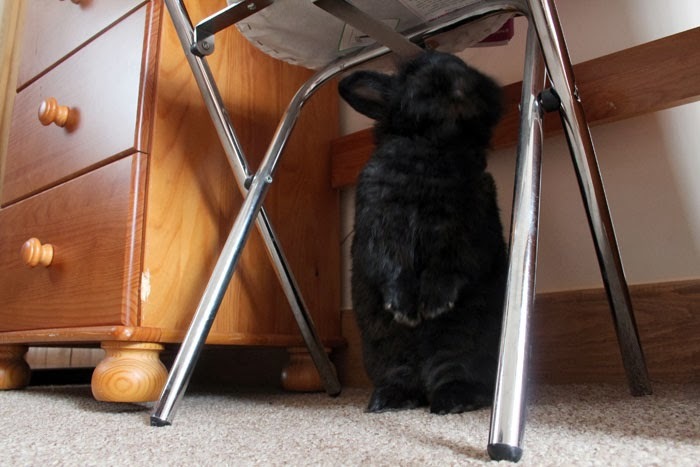 If your bunny will be living inside, please take the time to bunny-proof everything. If they come across a wire, they will chew it! Keep your bunny and your possessions safe! 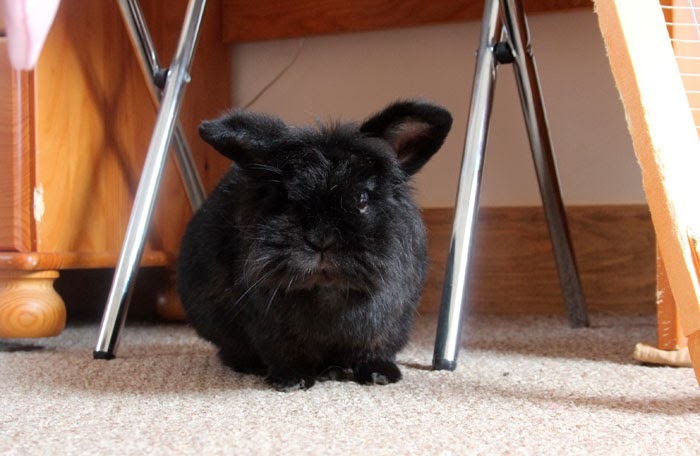 I really don't want to put anyone off adding a bunny to their family, just please know that they're a lot of work and they may not be super cuddly in return. They do have wonderful personalities and it's such a pleasure getting to know what they like and what they don't. 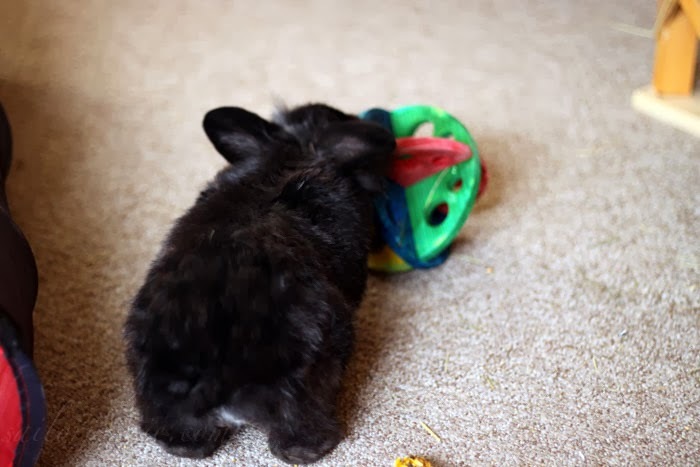 When I'm sitting on the floor, having little Ralphie hop over for ear rubs and a treat is the cutest thing that never fails to put a smile on my face! And if you're absolutely sure a bunny is for you, please consider adopting! There are a lot of bunnies out there who would really love a new home, where they will be properly looked after. I love this post! I don't think people realise how hard work bunnies are! Ralphie is perfect. This is the sweetest post. Sometimes people really do need to know what they are getting into with pets. My friend had a bunny she let out around the house and it would follow you around and sit on your lap, cutest thing ever! Aw, I love him. He is so tiny and cute! Ralphie is really cute - my friend had bunnies and one was a house one, a giant species (I'm not sure what type it was) and she used to chew everything. Wires, shoes, etc - she was much worse than a puppy! What a lovely post & what a cutie Ralphie is! i adopted a bunny back in college (a friend didn't want her anymore...) and definitely agree that they are a lot of work. and as a first timer owner i had no idea how to care for it really! thank god for google... your tips are great, hopefully no innocent bunnies become christmas presents for kids this year! He's adorable. I've always wanted a bunny but I knew they'd require so much commitment so I never bought one. Instead, I used to make my parents take me to the local pet shop every so often so that I could see the bunnies there! Excellent post, I think its great that you've highlighted all aspects of owning a pet like Ralphie, think a lot of people don't realise how much responsibility it is! They're certainly a lot of work, totally worth it though! So cute! I had two bunnies when I was 13, I loved looking after them and would love another one now but I just have the time! Eeep! I"m in love how cute is your bunny! I don't think I'd like being picked up either so I totally understand why they don't like it! My little brother had two bunnies, but since they wouldn't play back with him he just got so sad!